This is a partial list of edible molluscs. Molluscs are a large phylum of invertebrate animals, many of which have shells. Edible molluscs are harvested from saltwater, freshwater, and the land, and include numerous members of the classes Gastropoda (snails), Bivalvia (clams, scallops, oysters etc. ), Cephalopoda (octopus and squid), and Polyplacophora (chitons). A large number of different species of molluscs are eaten worldwide, either cooked or raw. 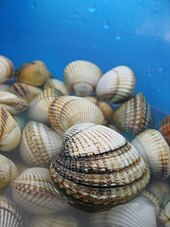 Some mollusc species are commercially exploited and shipped as part of the international trade in shellfish; other species are harvested, sold and consumed locally. Some species are collected and eaten locally but are rarely bought and sold. A few species of molluscs are not commonly eaten now, but were eaten in historical or prehistoric times. The list is divided into marine and non-marine (terrestrial and freshwater) species, and within those divisions, the lists are primarily arranged taxonomically, so that related species are grouped together. These sea snails are edible; some are listed by genus, others by species and others by their common name. Note that the common names of edible bivalves can be misleading, in that not all species known as "cockles" "oysters", "mussels", etc., are closely related. 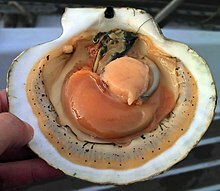 A live opened scallop showing the internal anatomy: The pale orange circular part is the adductor muscle; the darker orange curved part is the "coral", a culinary term for the ovary. ^ Akimichi, Tomoya. "The Enduring Appeal of Abalone". article. Kikkoman.com. Archived from the original on 2014-08-16. Retrieved 2008-10-14. This page was last edited on 16 April 2019, at 23:22 (UTC).